After the first performance in 1989, a child walked up to Mr Sanjoy Roy and said "Bhaiya, pehle to main sochta tha ki koi humari baat sunte nahin hain, aur ab maine dekha ki itne bade bade log baith ke auditorium mein humari baat sun rahe hain. Main to kabhi socha bhi nahin ki ye mumkin ho sakta hai." (Brother, I used to think that nobody listens to us, but today I saw so many important people sitting in the auditorium, listening to us. I never thought it was possible). Through the experience of performing arts, SBT has successfully instilled this sense of self-confidence and dignity, which is other-wise so amiss in the lives of these children. Believing in the latent talent of every child, performing arts are used as the springboard to enable the journey of reflection, expression, and empowerment. 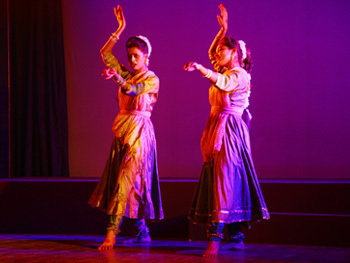 SBT has an extended association with performing arts, which stretches over a period of 25 yrs. In fact, the Trust traces it's roots back to Mira Nair's award winning film 'Salaam Bombay', 1988. The making of the film has exposed the raw vulnerabilities of street children. 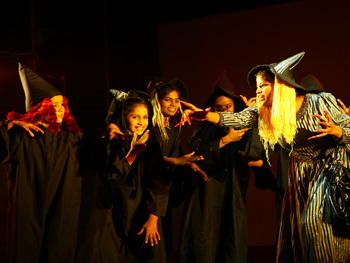 Around the time in the mid 1980s, Theatre Action Group (TAG) began working with street children. What started out as a simple act of interacting with street children transformed into cause-driven process to give the children safer and holistic opportunities. While TAG member would religiously scout the railway station for street children, build a rapport, provide them with a glass of boiled milk and an egg, read the newspaper to them; the group realised that they were yet to penetrate beyond the layers of confidence and attitude. They felt somewhere they were unable to reach the child in these children. That is when Nukkad was formed to use remedial drama as a therapy for the children to answer some of the issues that they had. Workshops for the first full length play "Jivan Ki Gaadi" directed by Mr. Barry John began in the middle of December, 1989. As Mr Mohit Satyanand exclaims, "What happened there on, was phenomenal!" ....the stories of pain, abuse, insecurity and broken dreams just flowed at the workshop sessions at Triveni Kala Sangam. The play was a catharsis for the children. Build around their lives, they managed to sensitize the urbane youth about what happens on the streets through the play. 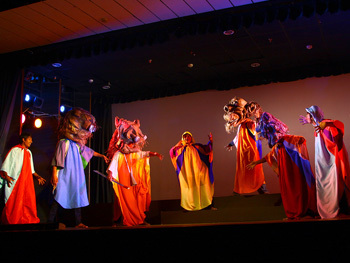 The show was hosted at the venue, Sardar Patel School on 18th January 1990; JNU centre on 10th February 1990; Law Faculty, DU; and IIC on 12th February 1990.What followed has been a long list of theatre productions, activities and camps for the children, where children have healed their wounds through the finer nuances of performing arts. 'Art imitates nature' in popular perception, but sometimes the relationship is more mutual. Mrs. Praveen Nair, Trustee SBT recalls "With the film Salaam Bombay, we realised that there is a problem of the street children but their spirit of survival is their strength." Thus, over past 25 years, the approach has always been to rely on the never-say-die spirit of the children. It has never taken the sympathetic benevolent route to address children's issues. The SBT annual plays have also been an important event where the children express themselves and showcase their talents and are looked forward to by everyone. It is amazing to realise how effective these endeavours are. "Art has always been a fundamental in Salaam Baalak, whether visual, performance or cinema" says Mr. Roy. There are numerous stories of children responding to the arts in miraculous ways, including wishing to go back home, abandoning drugs, making friends, getting encouraged to discuss their lives, finding their homes, and most of the times, themselves. The 'catharsis' happens here on different levels. Many of the children have gone on to become successful choreographers, photographers, puppeteers, actors, and their capacity to earn and the respect they have in society as artists is great. Also, the exposure that these children get through the arts is immense; they travel the world and learn so much about art-and life. Every day more than 50 children migrate with / without responsible adult company from the hinter lands of India into capital city New Delhi. Due to a combination of various socio-economic exigencies such as poverty, dysfunctional family structure, human trafficking, economic exploitation and bonded labour, it is estimated that there are more than 50,0001 children living on the cruel, unfeeling streets of New Delhi. Even though a safe space and an enabling environment exist within the residential centres for the child, it is but a substitute for a family. Therefore as soon as a child's family is traced adequate steps are taken in close coordination with CWC to send the child back to the family. Over the years the centre staff members have restored children to far flung areas of the country and even outside the country specifically in cases where guardians cannot come to take the child back. To keep the strings connected centre staff follows up with the family to check if the child was doing fine and had adjusted well. SBT has conceptualised an effective job placement and rehabilitation programme for reintegration of children who have grown-up/turned 18 into the mainstream society. The programme not only has definite goal of dream and vision development but also looks at dream modification and correction. Many a times children develop unrealistic expectations from themselves which may not correspond to the skill sets they possess. It is common to hear children say 'I want to become an actor or a film director or a cricketer' though achievable these aspirations require inherent talent that all children may not have instead they may have abilities to excel in other professions. To address this aspect, as soon as a child turns 16, staff members strike up a conversation with the child around his/her career, regular meetings with the career counsellors are organised and a rehabilitation plan is drawn to prepare the child step out of protective auspices of residential centres. The implementation of rehabilitation plan includes interaction with the child steered by career counsellor and the centre coordinator on a monthly basis. The focal points of these interactions are strengthening a child's resolve towards the career path he/she has chosen and whether the rehabilitation steps are panning out as per the plan or not and. Preparation of a child for rehabilitation may be fraught with challenges as children are sceptical and scared about leading an independent life outside the centre; they may also become angry and hostile or may distance themselves from the staff members. These negative emotions of young boys and girls at the threshold of maturity are understandable and staff members help them overcome these emotions by recurrent talks and assuring that SBT team would be a 'call away'. Role model interaction is a unique aspect of SBT's rehabilitation programme. Role models are young adults rehabilitated by SBT, who have established themselves as successful professionals. They visit various residential centres periodically to interact with children who are soon to be rehabilitated and share their stories of 'doing well' in the outside world. These interactions serve as a platform to quench children's curiosity who have scores of questions about starting a life of their own in the outside world. The most outstanding feature of these interactions is that they leave children with a feeling that 'If they (role models) can do it I also can do it' rousing them to work hard and make a mark of their own. Once a young adult finds a job, SBT staff arranges for basic requirements of the child to start a new life such as ration for a month, utensils, bedding etc. Even after a child is rehabilitated SBT team maintains contact with the child to ensure that he/she find stability and enjoyment in their work. The team also keeps in touch with the employers for a minimum of six months to ensure that rehabilitated children have adjusted to the new work environment. Due to some unforeseen circumstances if a rehabilitated child quits his/her job, the team begins a process of placing such children in new agencies. The process of replacement of a child is carried out again in cases where a child expresses dissatisfaction with the second set-up as well. 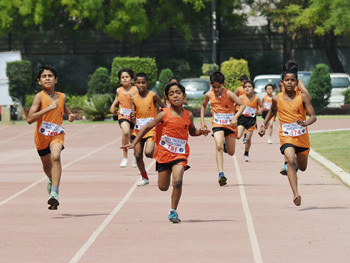 Thus, rigorous efforts are put in to make a rehabilitated child self-reliant. In addition SBT also supports children who want to study further by incurring 50 percent of the course expense apart from facilitating the admission process. Similarly children who look at upgradation of their vocational skills through advance courses, SBT encourages them by making a contribution upto 75 percent to the course fee. In cases of medical or other emergencies when rehabilitated youth need assistance, SBT provides them immediate succour till five years after their rehabilitation. Children are introduced to a new life with a message that SBT team would be there with them in their 'thick and thin'. It is because of this reason many children passing out of SBT keep coming to meet the staff members and trustees of the organisations forming a lifelong relationship of love and care.